Carl A. Gerstacker was born in 1916 in Cleveland, Ohio. At an early age his father, Rollin, instilled in him an interest in finance and the stock market. In 1930, when Carl turned fourteen, Rollin advised his son to withdraw his paper-route and odd-job money from a local bank and invest it all in The Dow Chemical Company. It was the beginning of a relationship that would last a lifetime. After high school, Carl landed an hourly position with Dow Chemical as a lab assistant and, at the same time, pursued an engineering degree at the University of Michigan as part of the company’s student training course. After graduating in 1938, Gerstacker continued to work for Dow Chemical until the outbreak of World War II when he joined the U.S. Army. Returning to civilian life in 1946, he was rehired by Dow and quickly moved up the corporate ladder, becoming Treasurer in 1949, Vice-President in 1955, and Chairman of the Board in 1960, a position he retained until 1976. He retired five years later in 1981. Carl Gerstacker was a business leader who believed that every company had a special personality and that the Dow personality was largely shaped by its employees. “For Dow Chemical, people are the most important asset, not the patents, the plants, nor the products.” Gerstacker’s personal financial acumen was rivaled only by his own contributions to the sound corporate growth of Dow Chemical, a business he loved and to which he devoted his life. Gerstacker died in 1995, leaving a legacy that lives on in the form of numerous philanthropic endeavors he began during his lifetime and on whose boards he once served. 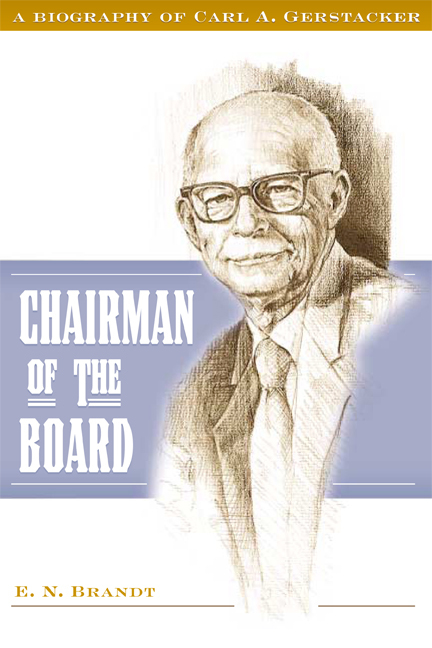 Carl A. Gerstacker was one of the towering figures of twentieth-century American industry. E. N. Brandt has been the company historian of Dow Chemical since 1983. A journalism graduate of Michigan State University, he served as a U.S. Army officer in World War II, as a United Press correspondent, and as a U.S. State Department employee in Europe before joining Dow’s public relations department in 1953.